I finally finished the Santa Stocking Cap! Yay! I can’t believe this project took nearly two months to complete. But I’ve said it many times — I’m the slowest knitter in the world. To recap — pun not intended! — The pattern is called, “Long Winter’s Nap” from KnitPicks. 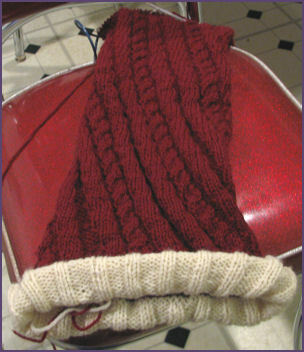 It was from “A Trio of Cabled Hat Patterns,” and unfortunately the pattern is no longer available. 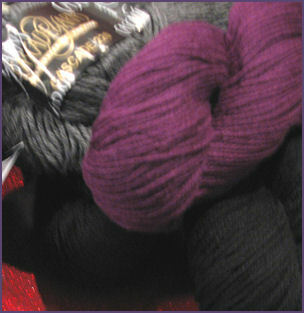 I also used Wool of the Andes, in colors Hollyberry and Cloud. I used about 3 1/2 balls of the red and one of the ivory. All in all this hat was very fun to make, but it did take a long time, so I don’t know if I will do another one. It would have to be for just the right person, that’s for sure! My daughter saw me trying the hat on yesterday and pronounced it just goofy enough to be “me.” Now the question is whether I am goofy enough to wear it to the office, even when it’s not Christmastime. Maybe I’ll save it for our first real snow. Now, I move on to a rainbow-y colored baby blankie, inspired by the Aran Afghan project from Knitty Gritty, and my buddy Joan. I’m going to do a bunch of different squares in different stitch patterns. The squares will be done in panels so hopefully finishing will not be insurmountable. Wish me luck! Happy Birthday, Steven! May all your dreams come true. It only seems like yesterday when we were bringing you home from the hospital! 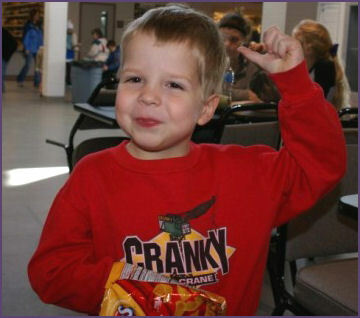 Time moves quickly when you’re grown, so don’t grow up too fast. I love you! I was knitting with Rhoda yesterday, and I commented to her that there was no way I could be getting gauge on this hat, because it was only supposed to take 3 balls of the main color, and here I am, at the end of the third ball, and nowhere near done. Now, I know sometimes that happens in knitting, but late last night it hit me. I’ve made a mistake. A pretty big one. See how there’s a stockinette band on either side of the cable band? In doing my decreases, I’ve decreased the band on one side, but not the other!! How dumb to miss that! I thought the decreases were seeming like they were taking forever, and I’ve even nicknamed this hat, “The Hat That Will Not Be Done.” Now I know why! But, rather than rip back more than 30 rows to correct the problem, I’ve decided to ADD 20 rows to the pattern, so I can throw in those other decreases at a reasonable interval, and then get to the point where I’m actually supposed to be for finishing the pattern. DUH! The hat is long enough already, and yes, now I’m going to make it even longer. But in the end, I think it will be ok. I just feel like a total idiot in the meantime. And here I thought I might actually be done this weekend. Guess not! Perhaps this will be the longest stocking cap on record. Yikes! 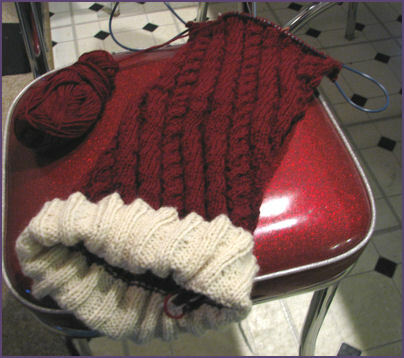 So Wendy Johnson started this thing called Knit From Your Stash 2007. What a grand idea! My husband and my mother both complain about my sizeable piles and boxes of yarn. I’ve got plenty to knit with that will last me probably quite a few years. But you see, I’ve got this teensy little problem! People keep giving me reasons to do things with yarn, and there are times when nothing already in the stash will do! Even Wendy has an exception for knitted gifts, right? So a couple weeks ago when a coworker announced that she was pregnant, I just had to get some brightly colored, soft yarn, with which to make the best rainbow-y colored blanket ever! I’ll admit that it is not a terribly expensive yarn, but it is super-soft, and washable! Which are two things that would be way high up on my friend’s priority list. But what to do with the yarn? I’m still debating. I’m leaning most toward a pattern I just discovered in Knitty, Lizard Ridge. But I’ve also visited the exquisite designs at Wooly Thoughts, and am even considering the Flying Geese Blanket from Mason Dixon. And then my friend Rhoda got me the Kaffe Fassett’s Pattern Library from the library where she volunteers. Such an inspiration! Man, I have no idea how people just dream up this stuff. I’m dizzy! I have no idea which design I will finally pick. But of course, there’s more than just the yarn for my friend’s baby blanket. Why, that yarn is almost excusable! I’ve also been amassing, accidentally and on purpose, some quantities of wool. Wool is a good basic thing to have in one’s stash, no? Well, I finally found a shade of purple that I adore, and Cascade 220 makes it! I bought enough to make a felted bag, but when it arrived I decided that it was so perfect that someday it will be a hat, scarf and mittens for me. HAD to get some gray to go with it, but when I originally placed the order, instead of the purple, they sent black! I was going to send it back, as generally I hate black yarn and what was I going to do with 8 hanks anyway? Then I decided to use some as trim for my mother’s green hat, and my daughter has been begging me to use the rest in a black hat for her. So we shall see. G~d, I hope she’s not going goth already! Help me! Happy New Year! As predicted last month, I didn’t finish my Santa Hat project in time for the holidays. But I’m still enjoying working on it, and I am starting to see the light at the end of the tunnel. I’m on row 46 of 107 of the decrease rounds, and they’re finally feeling like they’re decreased enough to go faster. I’m already planning my next several projects, but am determined to finish this one first. I get lots of questions about this pattern, because it is so unique with the spirals and cables. 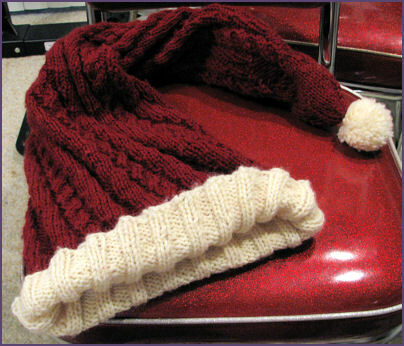 I can tell you that it was featured by KnitPicks, in a pattern called “A Trio of Cabled Hat Patterns”. I guess it didn’t sell very well or something because they don’t carry it anymore. This particular hat is called “Long Winter’s Nap.” I wish they hadn’t stopped carrying it, because I do get so many questions about it since starting to blog about this project. To be fair, I did buy the pattern last year when they were promoting it, but I could not work on it at that time because my dad passed away just before Christmas and I was having a hard time doing any knitting, much less something with a festive theme. And now that it’s a year later, and I’m actually excited about the project and people are writing to me about it, it’s no longer available. Sorry! Oh well, I guess it’s like picking up a magazine two years after the fact and knitting a pattern from it. Last Saturday my knitbuddy Rhoda and I got together for some knitting time, and in the end, neither one of us knit a stitch! We spent a long time looking at knitting books and getting inspiration for future projects, and then Rhoda helped me ball up some hanks of green yarn that I plan to make a hat for my mother with. 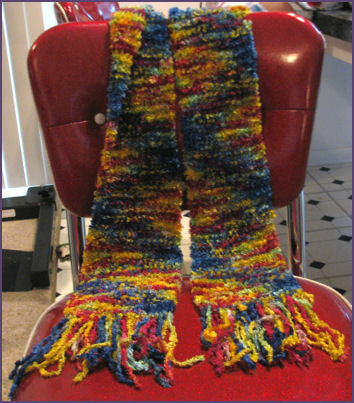 As a lovely surprise, Rhoda presented me with this lovely, rainbow-y scarf. She had brought it here one other time as a WIP, and I admired it dearly then. So imagine my surprise when she gave it to me! I wore it to work yesterday and got lots of compliments. Thanks, Rhoda! It’s beautiful, and I love it. 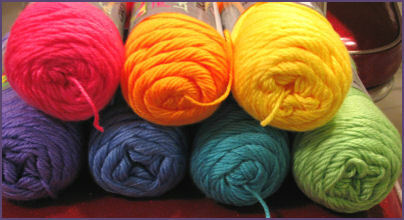 Someone posted this site on one of my mailgroups recently: Citizen Skein. This page contains things that I would just never imagine ever knitting! (Warning, the site contains images of knitted “ahem” body parts!!) I’m now even more convinced that too many people have too much time on their hands. And ZÃ¶e says, Happy New Year; now go away!